We, Marie Munk and Stine Deja, are two London based Danish artists. Our show, ‘Synthetic Seduction’ will open at SixtyEight Art Institute in Copenhagen on the 8th of June, 2018. To introduce the background to the show, we have put together the following ABC, where you can get an insight into our key inspiration, creative process, Japanese cuddle cafes and more. Our first collaborative show, 'Synthetic Seduction', was first exhibited at Annka Kultys Gallery in London from February to March 2018. 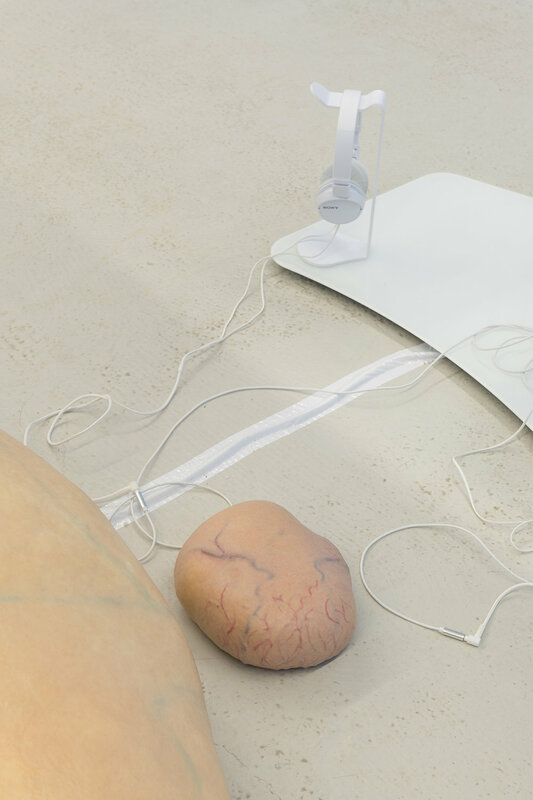 “The blobs” was the working title for the humanlike skin sculptures featured in the show. They were the starting point of the collaboration as they were created as a digital 3D-animation but also as physical sculptures. 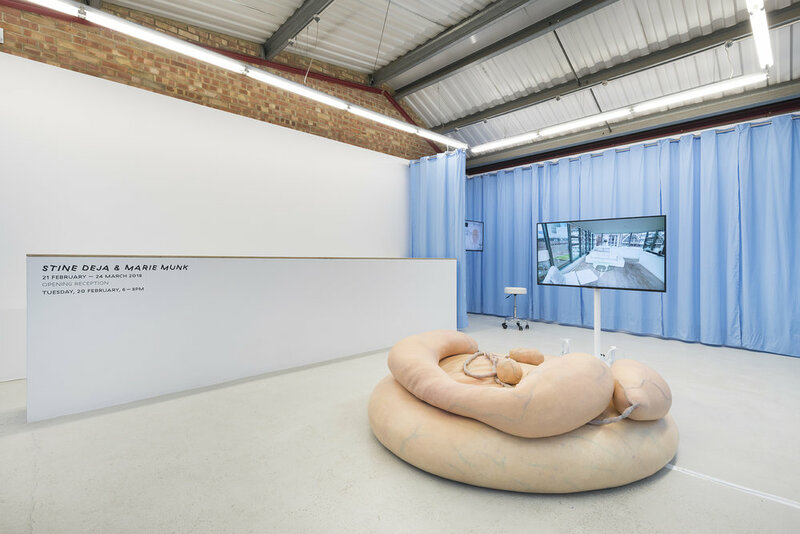 The skin sculptures are central in the show as they are interactive objects – in the gallery space guests are invited to sit on, touch and interact with them. In Copenhagen we will also create a site specific installation around the blobs. Stine Deja & Marie Munk, Synthetic Seduction. Installation view, Annka Kultys, 2018. We both studied at Kolding School of Design and Royal College of Art in London, so we knew each other for a long time before we decided to collaborate. We have very similar interests, but approach subjects from different angles. This has been such an inspiring way of working and it was a super fun show for us to create. It is so great to have someone to discuss things with at all times, and luckily we agree on almost everything! One half of the artistic duo is Stine Deja, a Danish multidisciplinary artist working with installation, video and sculpture. Deja explores the overlaps and gaps, the malleable borders of the ‘real’ and the ‘virtual’. As digital technologies are now almost ubiquitous in every part of our lives they are also becoming more invisible, her work uses digital surrogates and narratives in her videos to emphasise the different ways that we have become distanced from ourselves and other people. A lot of the work focuses on the irony and melancholy in modern social interactions and our society. If we take it for granted that robots and AI (Artificial Intelligences) are going to take over a lot of the things that humans do, it can be interesting to mark out the limits of that. Researchers are looking into the ways that machines can be affectionate and emotional – feel empathy perhaps. How is this going to affect us humans? Technology is becoming more and more human, but at the same time technology makes us less and less human, something like the dawn of predictive text actually makes us communicate more like robots rather than overriding the predictive system in order to express ourselves organically. The fact that we are all to some extent cyborgs confuses us on an emotional level. Is it still sweet that somebody remembers my birthday even when Facebook reminds them about it? 'Foreigner' is the title of one of the videos in the show. ‘Foreigner’ because it is the name of the band singing the song in the video but also because it refers to the character we see - a new species, an ‘other’, a foreigner. With AI we have a wonderful opportunity to erase gender stereotypes and create something genuinely equal, fluid, non-binary. But sadly AI is a product of the world we already live in and most often it perpetrates the stereotypes and restrictions that we already have. This is a terrible missed opportunity. Technology has so much potential to overcome biological restrictions and allow users to reimagine self-expression and identity, perhaps beyond sexuality, race and gender. That’s why its frustrating that we apply gender stereotypes to robots/personal assistants, why are the majority of personal assistants female (Siri, Alexa, Cortana)? We are basically transferring the systems, history and behaviours we know onto these pieces of electronics - it doesn’t feel revolutionary. Our installation is inspired by hospitals and scientific labs as we feel that this clinical vibe really adds a layer to the exhibition ‘narrative’. Hospitals are in general very interesting spaces. Typically this is where we are born, it might be where we die, it’s where we go when we encounter illness or have an accident. It's a space where reflection upon life is strong, and where many come to understand who and what is truly important to them. Creating this clinical vibe allowed for an experimentation with humanity, both in the bodily and the abstract sense, it mirrors reality with the development of robots and artificial intelligence and biological 3D-printing. Our very substance is increasingly becoming a material for experimentation. The surgery room is also a sort of neutral space, fantastic and groundbreaking but also a place where awful things can happen and where human life is always the focus. The blue curtains felt like the perfect solution because we also wanted to avoid a typical gallery setup with works placed on the walls - eliminating the walls forced us to rethink placing the works where people will interact with them. One of the first things we knew we wanted with our show was to create something super interactive. We want the guest to feel something and be playful - human interaction is the final element that completes the artwork. One of the videos in our exhibition uses dialogue from a documentary where someone visits a Japanese Cuddle cafe. We researched a lot about cuddle cafes, as they are a fascinating site of synthetic intimacy. The concept of intimacy and human contact as a commodity makes sense with the world we live in where so many of our deepest feelings are mediated through devices. The phenomenon of skin hunger is very interesting to us and certainly something that is explored through the show. From October 30th – November 16th, 2018 we will be showing 'Synthetic Seduction' at the independent exhibition platform KH7 Artspace in Aarhus. We both live/work in London, so that's the backdrop to this collaboration. One half of the artistic duo is Marie Munk, an interdisciplinary artist, working with sculpture, installation, video and performance. Her work examines the materiality of physical interaction and artificial simulation of intimacy. Using silicone as a metaphor for the bodily, Marie Munk creates alternative realities, which questions current tendencies in society. Something we thought a lot about is the narrative of the show. How will the viewer perceive the exhibition (which in it self is such a non-linear experience)? What are the stories they will be telling after their visit? When we started working on ‘Synthetic Seduction’, we were talking a lot about how technology is an easy way to escape reality. It makes emotions easy. It is easy to say difficult things on Facebook. There's an urge to do emotional stuff via technology and at the same time, we use surrogates to replace physical contact. It's not something that is commercialised yet, but there are research groups who aim to invent replacements for physical contact. It could be mini versions of the partner for couples who are in long-distance relationships or a teddy bear for kids that vibrates when their parents cannot be there enough. Parents would press a button and they would feel like they are there for their children. A robot that would follow you around could actually spark the same hormonal reactions as you would achieve when touching another person. Physically, our body needs contact with other people, otherwise we tend to get depressed if we don’t get the necessary oxytocin hormones. That means that technology may even be capable of taking away the physical need to be with other human beings. All these solutions are good examples of how we use technology to solve problems that technology created. The solutions are made to replace the physical contact – they are touching upon a core aspect of what it means to be human. It is interesting that we would accept these kinds of things. Stine Deja & Marie Munk, Synthetic Seduction. Installation view, Annka Kultys, 2018. It’s interesting to consider how in fifty years time, the way that we understand ourselves and interact with other people may have completely shifted. With each new invention incorporated seamlessly into our life, our society and norms shift in turn. Humans need to adjust to change, it isn’t always easy and there is usually somebody against it. When the typewriter was invented, with the apparition of the book, many were against it saying that nobody was going to look each other in the eyes anymore or have a conversation. Now we cannot even understand this thought. “How many curtains left! ?” - probably our most asked question. We’ve been sewing day and night. Luckily we got the effect we wanted. Our goal was to create a show where people really get to feel something, whether it's love, disgust or repulsion. We wanted to create a synthetic experience that would make the visitor feel ambivalent about whether it's a pleasant or an unpleasant experience. We wanted to create an absurd situation where people on one hand would feel very comfortable because the skin is soft and massaging them, and on the other hand be repulsed and uncertain about what they are experiencing. We wanted to balance seduction and repulsion. The aim was to make the skin figures so humanlike that they would almost feel real, while simultaneously giving people a highly synthetic experience – an understanding of the fact that they were manmade. We were both intrigued by the idea of simulated intimacy. During the research process we had lots of ideas for different shows, and we actually came up with this title for something else but then got really attached to it. 'Synthetic Seduction' was kind of the umbrella term under which a lot of ideas were developing and so in this case the title maintained our focus. What we are interested in is not so much technology on its own. What we find super interesting is how we as humans change around and with technology, and what it means for our development and social interactions. The concept of the uncanny valley is super inspiring to us. It’s a concept that suggests humanoid objects which appear almost, but not exactly, like real human beings elicit uncanny, or strangely familiar, feelings of eeriness and revulsion in observers. For a while there’s been a lot of talk about how the uncanny valley is dying as the lines between fiction and reality are so blurred now that we simply can not tell the difference. We are a bit worried about the rise of virtual assistants. They have been dressed up as a very helpful and necessary, but really it’s just an incredibly easy way for giant corporations to sneak into the core of our lives, our homes. There has been numerous stories about how Alexa is suddenly, out of the blue, laughing in a very evil way. Or how ‘she’ is listening in on our conversations. We read a story about Alexa having sent a private conversation between a couple to one of their friends by accident - without their knowledge. Where it becomes a bit problematic for us is when we incorporate these new technologies into our lives without much scepticism. We are constantly replacing one technology with the next without really evaluating the long term damage or dependence. Marie Munk & Stine Deja. Virtual spaces come with freedom to play with identity, in these spaces we can reimagine ourselves and use anonymity as a way to explore new ways of being, communicating and building relationships. Undoubtedly ‘freedom’ is something that is inextricably linked to online worlds, we go on Safari, we are Explorers and indeed many bodily limitations are left behind as we masquerade and morph to get the most from the World wide web. Rebekka Elisabeth Anker-Møller, Iben Bach Elmstrøm, SixtyEight Art Institute, Annka Kultys Gallery, Polytek and Statens Kunstfond! Stine Deja (f. 1986) og Marie Munk (f. 1988) er begge uddannede fra Designskolen Kolding og Royal College of Art i London. Stine og Marie har bidraget til idoart.dk siden 2018.